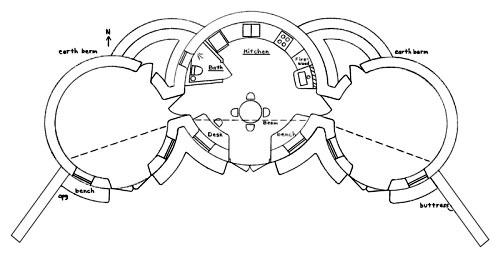 This design connects three sloped roof roundhouses and adjoining closets to create a unique roundhouse cluster design that is earth-sheltered on three sides – east, west and north – with a sunny courtyard on the south. The 16′ bedroom domes are shown without furniture to highlight how they can be used as home offices, studios, etc. This design features 6′ French doors and tall arched windows in each roundhouse, large walk-in closets, high exposed wood ceilings and exceptional energy performance. With the addition of a few features such as ceiling fans, heat recovery ventilation, solar panels and solar hot water heat, this design would meet zero energy standards. 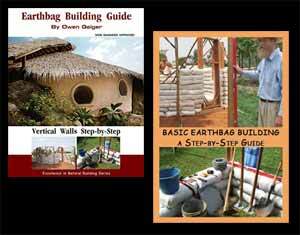 Round earthbag structures are inherently stronger than rectilinear designs, and the heavy timber roof provides exceptional strength as well. 785 sq. ft. interior, 2 bedroom, 1 bath; footprint: 28′ x 58′ plus buttresses. Because the bedrooms are offset from the main room, the shed roofs should overlap, making it possible to do the main room first (to use as a studio cabin initially), and then one can subsequently build on the other two loops, I would imagine. My main concern would be in how to tie the walls together. Ideally, wouldn’t we want to lap in the bedroom walls to the main room wall? Would it be possible to insert a perpendicular bag into every other course along the main room wall, with a wood block or something to hold the space until the bedroom walls could be built out? Do you think this design would be suitable for a first time builder? I imagine that one of the bedroom domes could be built first and the other sections could be built the following year. However, the shed roof would be difficult to build at separate times. All of my plans are basic enough for first time owner-builders if they first build a tool shed or something equivalent to learn the steps. Many plans such as this one can be built in stages as you suggest. Shed roofs are the easiest type of roof to build.